How Long Does Inpatient Lorcet Rehabilitation Last? Lorcet, a prescription painkiller, is a combination of acetaminophen and hydrocodone. Doctors prescribed over 42 tons of pure hydrocodone and 69 tons of pure oxycodone in 2010, according to an article on NPR's health blog. Lorcet rehab facilities are in greater demand than ever as cases of addiction continue to rise. Prescription painkillers like Lorcet are a common favorite of addicts, but people who are legitimately prescribed Lorcet are becoming addicted as well. As an opioid medication, addiction to Lorcet is tough to walk away from. Lorcet treatment programs can offer solid help. If you are considering a Lorcet rehabilitation center, you might be a little nervous. Short-term treatment or outpatient care may seem like comforting options since you know you will be back with your family very quickly. That is a plus, to be sure, but consider all your options before making a choice. Take the time to explore the kinds of treatment and services offered by long-term Lorcet rehabilitation programs as well. Use Our Contact Form or call us anytime at 1-888-341-7785 if you or someone you know is searching for an inpatient lorcet rehab facility to get in touch with an advisor who can help. How do you know when Lorcet has become a problem for you? There are people who treat their occasional pain with Lorcet, strictly following dosages to be sure they use the medication properly. Others may use Lorcet because they like the way it makes them feel, aside from its painkilling properties. When you become addicted to Lorcet, your life revolves around seeking the drug and taking the drug. When Lorcet takes priority in your life, you know your dependence on it has gone too far. Patients who take Lorcet regularly may find that more of the drug is required to achieve the same effects. One pill may have taken the edge off your pain before, but now you find yourself needing more. Addiction can be very hard to admit. When a person is addicted to a substance, there is a desperate desire to continue its use. Admitting that you are dependent on your medication means that you will have to learn to face life without it. Still, most people know when their Lorcet use has crossed the line. People who are considering a Lorcet treatment facility may feel embarrassed. When someone is facing his or her addiction, they want it to be a private matter. Addiction is a medical condition. Privacy laws protect the privacy of patients' medical records. Don't let embarrassment keep you trapped in addiction. You deserve help. 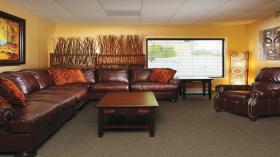 Private Lorcet rehab centers make sure that patients have the space they need to reflect and recover. Offering patients private rooms is one of the ways these facilities help patients feel at ease during recovery. The answer to that question varies, as there are programs of different lengths available. Some treatment centers offer rehab programs lasting one, two or three months. It is important to thoroughly research the various programs offered by the Lorcet rehab centers you are considering. Not all of the services may be the same. Rather than making a choice based on program length, it might be wise to choose a program based on the kinds of services offered. Keep in mind that your Lorcet treatment program is the foundation for your future. When patients first arrive for addiction treatment, they will be led through the intake process, shown the facility and given some time to make themselves at home. Medically supervised detox treatment will take place, oftentimes before any kind of drug counseling begins. This gives patients a chance to get their feet under them before they begin the important job of learning new tools for sober living. Understand the roots of addiction can be invaluable to preventing relapse. -Rehabs.com There are a few different kinds of therapy offered at top Lorcet treatment centers. One-on-one counseling, group counseling, and dual diagnosis treatment help patients gain a deep understanding of their drug dependence. Understand the roots of addiction can be invaluable to preventing relapse. Ask about other kinds of specialized care that might be offered. Also, familiarize yourself with the aftercare offered by your Lorcet rehabilitation program. Worries about money should not prevent patients from seeking the addiction treatment they need. Forty-three states now have laws requiring insurance plans to provide coverage for addiction treatment. Remember, addiction is a very real medical condition. You deserve treatment for your illness just as much as if you had some other physical disease. Call your insurance company to find out about their addiction coverage. Your Lorcet rehab facility can help you with this and may present you with payment options to cover any remaining costs. Since prescription pill addiction has become prevalent, Lorcet treatment programs are abundant. However, when you are choosing a treatment center for your recovery, it is wise to make your choice according to a number of important factors. Though distance is one concern, there are others. Be sure to ask questions about the services offered when you are investigating your options. Recovery is the foundation for your future, so distance may not be the most important concern. When work duties are stopping you or someone you love from looking for assistance for a problem with narcotics or prescription drugs or behavioral addiction, executive rehabilitation centers will be what's needed. By leveraging highly-rated narcotic, prescription drug or behavioral addiction treatments with the flexibility of occasional laptop and mobile access, a business person can achieve sobriety while remaining productive. Frequently, contemporary substance and behavior treatment clinics furnish the top-shelf amenities you'd expect only in America's best hotels, with your health and well-being being the areas of focus. From in-house massage therapy and housekeeping services to gym facilities and fine linens, you can get the highest-quality drug, alcohol or behavior treatment for yourself or someone you love while keeping comfortable. If you need assistance in searching for the best-rated luxury treatment programs for Lorcet addiction, call our helpline free of charge now at 1-888-341-7785. Luxury treatment programs are not going to leave you out in the cold. When you are ready to go home, you will be provided with ongoing support for sober living. Follow-up care and aftercare will be explained thoroughly before you leave the program. You can also ask questions about these services as part of your initial inquiry. Talking to your loved one about their need for care is not easy. When investigating Lorcet treatment programs, ask for advice about interventions. Assessment and intake staff can advise you on how to approach your loved one about their addiction. It can be comforting to your loved one to know that there will be medical assistance for the withdrawal process. Patients in private Lorcet rehabilitation centers are not expected to tough it out. Let your loved one know about medically supervised detox. Suggesting to your loved one that they enter inpatient Lorcet rehab may make them feel rejected or unwanted. However, residential drug treatment offers patients a chance to rest. Patients need the opportunity to focus on recovery without distraction. It is about wanting your loved one to recover so they can return home healthy and happy, not about sending them away. As part of your research, be sure to learn about the various kinds of treatment methods available. There are 12-step programs as well as those that take a non-spiritual approach. Some programs support holistic recovery, and others are faith-based. The kind of Lorcet treatment program you choose should be based on what kind of approach speaks to you. It is a very individual choice. When addiction has come into your life it can feel like all hope is gone, but lives are being rebuilt every day by the compassionate care offered at Lorcet rehab centers. Addiction can be overpowering and terrifying, but addiction can also be conquered with a little help. What are the street names for Lorcet? Am I addicted to Lorcet? What are the long-term effects of Lorcet abuse? The long-term effects of Loret can include dizziness, itching, nausea, sweating, blood disorders, changes in mood, racing heartbeat, mental fogginess, anxiety, lethargy, long-term hearing loss, and depressed respiration.